The shoulder is an extremely mobile and therefore complex joint. Injuries can be classified according to how they happened as this determines the management plan for the injury. Dislocation or sublaxation will result in injury to the joint ligaments, capsule and possibly the bone and labrum. Internal joint cartilage damage (labrum). Acromioclavicular joint (AC joint) sprain or ligament rupture. Small faults in biomechanics with enough repetition can result in injury to one or more structures in or around the shoulder joint. For example a throwing shoulder, heavy lifting or reaching to the back seat of a car. Degeneration is a normal process and we will all, to varying degrees, develop changes within the joint and in the rotator cuff tendons. 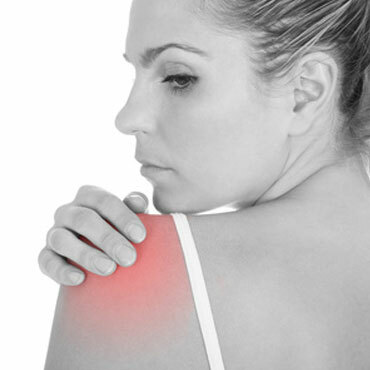 Because the shoulder is such a mobile joint, physiotherapists are best equipped to treat and initiate rehabilitation of a shoulder, often in liason with an orthopaedic surgeon. From nerve, muscle or joint structures in the the neck or midback from the diaphragm, visceral or bone sources. Shoudler impingement - this is often related to incorrect posture and biomechanics with overhead activities. It describes the compression of soft tissue (tendons, bursa and joint capsule) between the body structures of the shoulder joint. Bursitis is frequently part of impingement pain, can occur with calcific tendonitis or result from a fall.